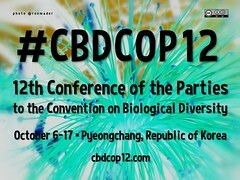 This event is one the most important on the globe for those keen on protecting biodiversity. When reports estimate losses of 40 percent of all land and sea animals since 1970, an action plan needs to be crafted yesterday. Colleagues who want to call attention and gather support for biodiversity conservation, there are allies outside the conference hall, but only if the social web is integrated. A hashtag is just one way of connecting people. We have to rethink communication beyond the megaphones and official press conferences. On the technical wishlist … I'd love to see a program of what's being shown on the webcast and when. It would be awesome to use Google Docs for collaborative note taking and the creation of transcripts. What if press conferences were conducted in South Korea as Google Hangouts with livestreaming video immediately archived on YouTube? Is anyone interested in updating the CBD's Wikipedia entry? I would be very happy if the organizers and participants uploaded some photos with descriptions to Flickr that include the Creative Commons attribution-share alike license. We – and other websites – would have permission to include these images in conference coverage. Later in October we celebrate Open Access Week. Think of the progress we could make if some of the biodiversity educational materials were available with open access licenses! On my personal wishlist … I'm hoping that event includes some forums and workshops about biodiversity's connection to travel and tourism. It's on the radar – take a look at the side events – but we can do so much more! We will also be paying attention to the continuing discussion from Indigenous Peoples. Having facilitated a workshop at the previous COP in India, I am keen on seeing what developments have taken place and what's on the current agenda. Comments welcome on my blog.